Salt is a Gastropub is Sussex County NJ. Yes, that’s right folks, a Gastropub in good ole Sussex County. In fact, the owners (Bradley and Laurie Boyle) have determined Salt to be the first New Jersey gastropub! Now, what exactly you might ask is a Gastropub? It can simply be defined as, a British term for a pub which specializes in high-quality food a step above the traditional pub grub. One of the owners, Bradley Boyle, recently competed on an airing of Chopped (one of my favorite shows, essentially it’s a cooking competition on the Food Network). Although he came in second place, the food served at his restaurant is tops! Bradley is a graduate of the Culinary Institute of America in Hyde Park NY. Upon graduation he apprenticed at the famed Le Cirque restaurant in Manhattan and then worked in a number of Manhattans finest restaurants before settling down in Sussex County with his partner and wife Laurie Boyle. Bradley has stepped out from behind the kitchen to manage Salt. He appointed Tony Mandeville (a graduate of the Johnson & Wales University) to take over the position of Chef. The restaurant features 6 beers on tap and has over 60 other varieties to choose from. My husband’s choice on our recent visit: Dogfish Head Imperial India Pale Ale. His review of the Ale: Refreshing! They also offer live entertainment every Friday, Saturday and Sunday evening. On our plates that evening for starters was the Salt Salad and Panko Crusted Chicken Strips. 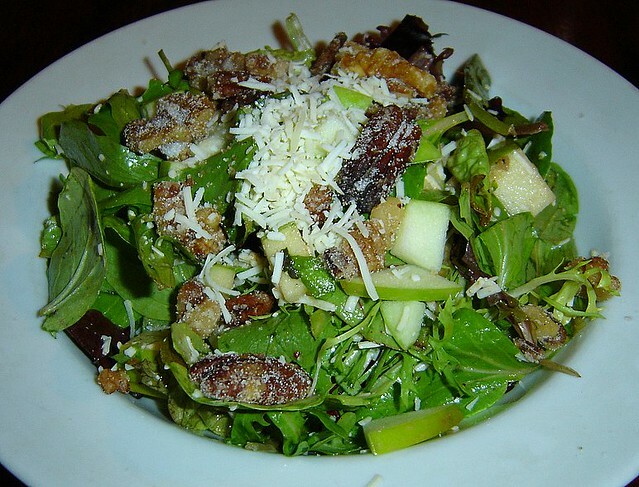 Their signature salad is prepared with fresh baby greens, sliced apples, candied nuts and artisan cheese, tossed in their roasted tomato vinaigrette. The combination of fruits, nuts and cheese on the salad was scrumptious. The Panko Crusted Chicken Strips were perfectly crisp and the dipping sauce – delightful. For our entrees, we moved on to one of the specials for the evening (a Strip Steak) and the Balbriggan Salmon. The Aged NY Strip Steak special was grilled in a spicy marinade and then placed atop a creamy potato puree with roasted carrots in a rosemary chimi-churri sauce. The flavors melded together brilliantly. The Balbriggan Salmon is a regular menu item, of which I savored every single bite! 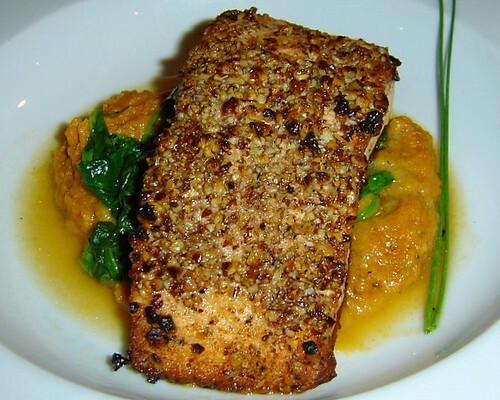 It as a pecan crusted salmon atop smashed sweet potato and sautéed spinach in a sweet malt vinegar sauce. Now if only I could get my veggies to taste that good maybe I’d cook more at home!